Good brands and agencies, with the genuine intention of driving brand advocacy, are being grossly misled by what are often referred to as ‘Influencer Marketing’ companies. There’s a pervasive dirty secret that isn’t being talked about because it’s been kept so well. They are powered almost exclusively by a small hyperactive group of sweepstakes and prize hunters. These ‘influencers’ have social profiles that tweet and share out almost exclusively sponsored content and nothing else, often hundreds of times a week. They aren’t providing real value. 95% of all the engagement (retweets, comments, etc) they generate is from other incentivized sweepstakes hunters on the same platforms. It’s incredibly easy to verify yourself. Search Live on Twitter for #sponsored (or a known campaign hashtag) and open the first three profiles. Let me qualify what follows by saying I’m a huge believer in the power of brand advocacy, and applaud brands that are harnessing that value in their digital marketing strategies. Leading brands have adapted from a singular focus on reaching a passive audience, to deliver work that inspires a community, and earns real loyalty and word-of-mouth. In fact, doing that in an authentic way is at the very core of why we built Crowdly. This recent mega–trend of major brands using certain types of ‘Influencer Marketing’ platforms I think evidences that same need, but what’s really happening under the covers on most influencer campaigns is somewhat shocking, a huge cause for concern, and once we walk through where to look, it’s undeniable. “Influencer Marketing” is a broad, quickly evolving term. There are some good companies that use that language and bad companies that don’t, so let me clarify. What I’m not taking issue with here at all are micro-targeted influencer programs, often led by an agency or PR department that hand-picks a half dozen or so subject matter experts for a high touch campaign. These can almost be thought of as a quasi-celebrity sponsorship model, and might focus on finding YouTube stars with a substantial subscriber base that do cosmetic reviews, or a well regarded travel blogger to talk about a hotel’s new resorts. While these can sometimes go awry when implemented poorly, such as pouring resources into someone solely because they have the right ‘look’ on Instagram, in the right hands these programs can do very well. The issue lies with broad “Influencer Marketing” platforms that have, as a universal defining commonality, their own large opt-in base of ‘Influencers’, available to rent on a per-campaign basis. These move beyond the handpicked dozen of subject matter influencers to the hundreds, thousands, or tens of thousands, who can be called upon to take action on behalf of any brand on a campaign-by-campaign basis. Perhaps they’ll tweet out reviews and mentions of your brand or new product launch, share posts on Facebook, or be involved in a ’Twitter Party.’ There are dozen of very similar companies that have sprung up in the ‘Influencer Marketing’ space. Some of the better known are companies like Crowdtap, Influenster, Bzzagent, VocalPoint, Splashscore/Mavrck, Smiley360, and House Party, but they’re hardly alone. An important note: I don’t have an inside source or any private information. I’m not privy to how anything was positioned or contracted. Everything revealed herein is based on an observation of public information following these campaigns across social networks, and I’m sharing where to look and what to look for so that you can draw your own conclusion. It’s easy to understand the allure of these Influencer Marketing platforms, a guaranteed number of tweets and retweets a brand can turn on for a fee, gaining significant organic reach for an important initiative. A quick look into the brands included in those sponsored tweets, and the logos on the influencer sites show a large amount of well-known and well-regarded brands. I strongly believe most of the brands and agencies utilizing these types of companies are doing so because they genuinely care about advocacy, they’re just not getting an honest view at what they’re really buying. They believe they’re connecting with relevant, influential people who share things they care about with people who’ll listen. The truth is anything but. The real secret behind these influencer communities is that they’re made up nearly entirely of what looks to be a small group of hyperactive sweepstakes hunters, with no clear affinity for the brand, seemingly willing to parrot a huge volume of anything that could win them a prize, and their actions are not affecting real consumers. This isn’t the exception, this is the rule. What’s shocking is how quickly anyone can take a quick peek behind the curtain once they know where to look, and see the plain truth of this issue for themselves. These accounts tweet almost exclusively sponsored content, hundreds of times a week, and any reactions generated are by other involved accounts. How bad is it? We did the math on the first 200 sponsored tweeters returned in a single search, and parsed their most recent 25 tweets. Click here, for a Twitter search for #sponsored (or search manually yourself, and then filter from ‘top’ to ‘all’ to see most recent). Due to disclosure requirements, some of the Influencer platforms or brands use #sponsored, #gotitfree #ad, or something similar in these types of campaigns. There will be several tweets in the last minute. Click on the most recent 3-4 profiles. You will not see interesting, influential people occasionally tweeting relevant sponsored content to an audience who cares. You will see accounts that tweet nearly 100% sponsored content, dozens of times a day, thousands of completely sponsored tweets about a hodgepodge of mismatched brands and direct competitors. Click on 4 more profiles, click on the campaign hashtags they’re tweeting about, and click 4 more profiles. I’ve spent hours down that rabbit hole trying to find even one real advocate, and haven’t found one. 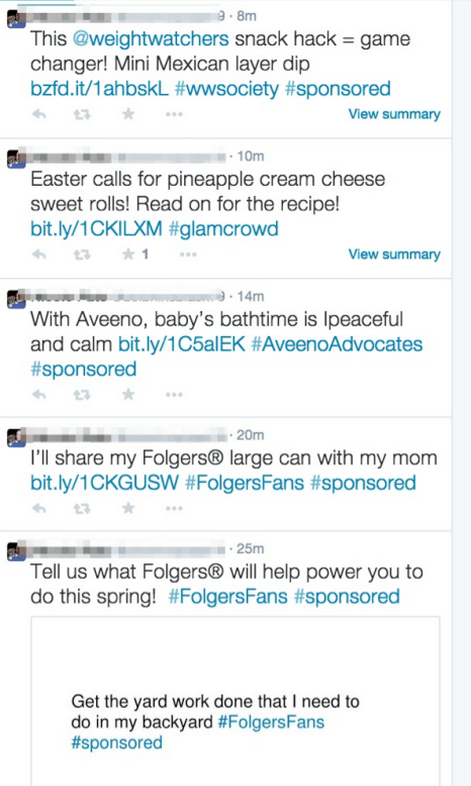 The accompanying screenshot shows an unfiltered 20 minutes of a very typical ‘sweepers’ individual Twitter feed, showing 6 canned, sponsored tweets from a random mix of brands. This is not the exception, this is the rule. They’re not reaching real people. Who would ever want to listen to someone who just spews random sponsored content? The answer seems obvious, no one. So why are some brands seeing a decent amount of retweets, favorites, shares, and likes? Because these sites generally operate by awarding one sweepstake entries for every tweet or Facebook share, and additional entries for retweets and comments, or some derivation thereof. Entries are typically for small value gift cards or freebie packs awarded at the end of every month. A whopping 95% of all those subsequent retweets and comments, the ‘earned engagements’, come from accounts operated by other sweepstakes hunters involved in the same platforms, “Sweepers” as they often refer to themselves. 95% of all subsequent ‘earned’ engagement is by other sweepstakes participants. Test this yourself with the same search above, it’s undeniable. So if this isn’t influential people causing broad engagement, but a small circle of inauthentic sweepstakes hunters swapping incentivized retweets, what value is it producing? This isn’t a small problem. A best estimate is that these types of pay-by-the-tweet “influencer marketing” companies generate about 4 million tweets a month, as well as significant and equally dubious activities on other platforms. This puts a best guess on the volume in the tens of millions of actions a month, and exponentially higher once we count the paid reactions, retweets, comments, etc. Genuine looking organic response to all of this activity is nearly nonexistent. This isn’t just on Twitter. On Facebook, the conversation isn’t as easily searchable as Twitter, and largely behind closed doors. Here the brand might be even more dependent upon reports of how many likes and comments these incentivized shares returned, it’s easy to see how rosy campaign reports touting robust numbers were delivered on these abstracted metrics, but the brands aren’t likely getting a full picture of real value. Below is a very typical comment thread on Facebook from one of these campaigns. Notice all the one letter comments from everyone? Does it look, even remotely, like any real conversation you’ve ever been a part of? Or does it look like profiles leaving one-character comments as quickly as they can to increase those comment report numbers, and earn more sweepstakes entries? We analyzed the chronologically most recent 100 posts on Facebook from these Influencer platforms, and found that the average character length per comment was 2.3. That’s not words, that’s characters, 2.3 letters per comment. Comments on Facebook shares are typically a few letters, just enough to earn a sweepstakes entry. An interesting pattern is the strong propensity of these participants to not want to use real, primary Facebook profiles to participate in these campaigns, perhaps because they don’t want to spam their friends. A quick search for profiles with “Sweeps” in the name on Facebook will bring hundreds of results, and you can see below, some users also take to appropriating an Influencer company’s name into their own profile. 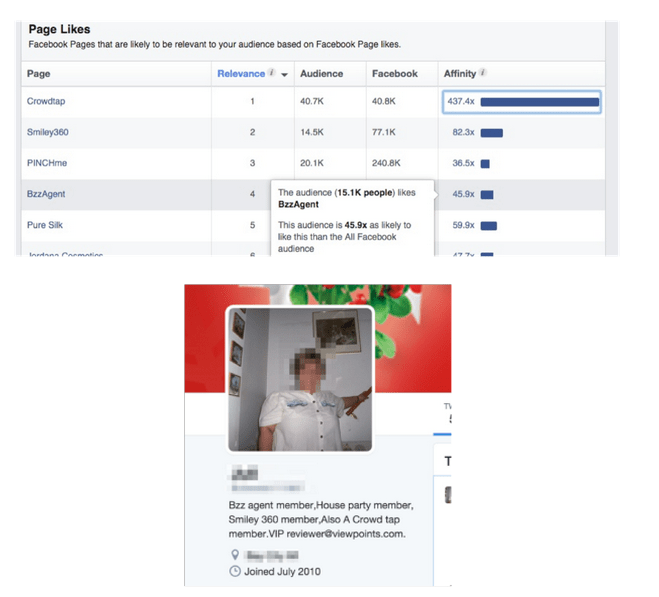 There are plenty of others that you can find that have taken that approach as well that are returned on a simple Facebook ‘person’ search. I’m not exactly sure how many people there’d need to be named Crowdly on Facebook interacting with my company for us to notice, but I’m pretty certain the number would hover around one. There’s gigantic participant overlap between the platforms. Sometimes people can’t get past the allure and push button nature of someone else’s big opt-in base. If I’m talking with a brand that’s determined to go with one of the Influencer Platforms that can offer that existing opt-in base of participants, my parting advice is to find the absolute cheapest one you can find, because it’s a lot of the same participants on each, and it looks like no one is listening anyways. On Facebook, a fairly strong affinity between two brands that you’d see naturally occurring might be something along the lines of 2.5x, meaning Fans of brand A are 2.5x (or 250%) more likely to fans of Brand B than the average Facebook user. Looking at the Crowdtap Facebook community below, we see an 82.3x affinity with Smiley360, 36.5x affinity with PINCHme, and a 45.9x affinity with BzzAgent. What this means is that the same small group is joining nearly every platform and tweets and shares on every opportunity that comes up. Your brand is what people say about you. The notion of a brand is intrinsically one of advocacy, real people saying things they really mean. And these broad ‘Influencer’ companies exist because there are good brands and agencies that care about advocacy, and we’re in a fast evolving space that’s still defining exactly how we measure success. Someone might get a report that shows 8,000 tweets and 12,000 retweets, that can be extrapolated to an estimated 1 million real people reached by organic, authentic word-of-mouth about your latest launch, but the evidence doesn’t support that extrapolation. Having 10,000 sweepstakes hunters pass your launch back and forth to each other isn’t just a missed positive or a neutral; it’s a negative, that inauthenticity hurts your brand. Especially for large brands, that have earned that love, that have such a strong asset of great people, connected and actively bringing those brands into the world. These authentic loyalists don’t want to mix with rented sweepstakes hunters, and might think less of a brand that employs them. Those of us involved in brand marketing, particularly those with involvement around advocacy, are being trusted to draw upon the earned love of that brand. Measurement is evolving, but character is fundamental, and we must hold that burden of trust very highly. If we don’t, our industry and our brands are set back, and the end consumer stops caring about what we say. We must do work that stands on its own true merits, and work that matters to us, and always remember that we’re allowed to do so only because, and only as long as, it matters, in some way, to the real people who care about our brands. This post first appeared on Steamfeed. Hi, Dan…I’m not shocked, merely disturbed. Coming from one of the Twitter originals in the early Great Recession when we bantered nightly and engaged in blogjacking comment sections in the pre-Google+ era, it’s always a challenge to see the erosion of authenticity in anything that used to be golden. Indeed, innovation must spin its course and at what cost? The demise of the ability for others to utilize social marketing for true strategy and campaign ROI is what’s happening, where the future is heading and how marketing disruption will meet its finest hour…like a nuclear bomb. The little guys create the platform, package it all into a lovely gift and present it to the behemoths to bulldoze and repackage into monster monstrosities. As I continue to wonder how best to serve my ‘little guy with marginal marketing budgets’ clients, I know that the balance toward less social marketing with its pay-to-play model will be where I direct strategy. And how to tap that customer will forever remain the Holy Grail with test, test, and retest. Well said Jayme! Influencer Marketing has morphed into this? Sad but true. As early as 7 years ago, I was trying to figure it out – reaching out to people with the loudest voices, biggest networks — people who needed convincing to partner with companies to develop content, help promote their programs. I wasn’t sure whether I was doing it correctly, however I was sure of a f ew things thing: we knew who these people were; we knew these people could not be “bought”; and we worked “with them” to develop initiatives that would appeal to their audiences, at the same time, moving towards the client objectives. We build visibility for the client, who was skeptical of this in the beginning. But more importantly, we developed sustaining programs with those members of the community we established as a result of the influencers program. A company who is willing to shell out the big bucks to get mega shares and mega viral effects needs a lobotomy. Their $$ are perpetuating these false schemes that provide artificial amplification. We are hoping these black hat tactics will be found out quickly so we can start to direct where this medium should evolve to. You are right, it’s still nascent enough that we need to continue to test what works and what is considered “acceptable” to the target customers. Ditto to you, Hessie. When you are my guest (and John Olson, cohost) on The Heart Of Marketing podcast, we will want to address this very topic and your book, Evolve, Marketing is Doomed. I know from my clients that so many of these tactics will have come and gone by the time I’m able to educate my clients on having a digital and mobile website. I can only hope that they … and the ‘rest of us’ will continue to innovate with some goodness and positivity over identifying the next big cyber $$ opportunity. It’s hard not to get discouraged after reading the latest Facebook scheme for the financial industry about credit scores of your friends network. So, Hessie, before I apply to refinance my mortgage, what’s your credit score? If you’re 600, I better unfriend you!! Ha! my credit score? I think it’s over 700. That is one data point – again where data discriminates without realizing it is doing it. Looking forward to the podcast Jayme! I agree, there’s a tremendous amount transpiring under the title of Influencer Marketing that has really gone way off the rails of what it’s intended to be. I do think these are growing pains around a pivotal change. Taking away the trends and terminology and focusing on the human need, we’re culturally more likely than ever to tune out or discredit traditional advertising and listen to the opinions of people we know and trust instead, and we’re digitally wired in a way that makes that exponentially easier and more effective than ever before. Unless someone wants to take the bet that the megatrends of 1.) Ad shifting/filtering, 2.) Digital interconnectedness 3.) Increased content creation and 4.) Peer curation and influence are all going away, the dominant role of word of mouth is unavoidable. Like most transitions, it’s awkward, cluttered with vanity metrics, fraud, and misappropriations of legacy tactics, but boiling it down to the core human need it solves, and thinking how we as humans would want it to function shows that the direction of that transition is inevitable. Brands just need to start admitting that the old ways of doing things are not working. You cannot get a quick ad-fix today to drive consideration, let alone sales — for all the things you mentioned already. If they start paying attention to consumer intent and needs and NOT how to push product, then maybe things will turn around…. however slowly. Hmm. And, shall we add programmatic advertising into the mix or is that purely data driven based on human behavior IRL? The problem with programmatic is that it was “remnant’ inventory that no one really wanted before. It was the cheapest to buy. Now that clients can go directly to buy media, effectively bypassing media buyers, programmatic becomes just another channel to buy media but optimization is the same: on click behaviour and cookies. I don’t know that it’s more effective but I do know it is disrupting the media ad space. The jury’s still out on this one.